If you want to enjoy a relaxing day away from the hustle and bustle of Tokyo, this one day tour to Kawaguchiko is what you need. Breathe in the fresh mountain air and spend your afternoon reveling in the natural beauty surrounding Mt. Fuji and Lake Kawaguchi. 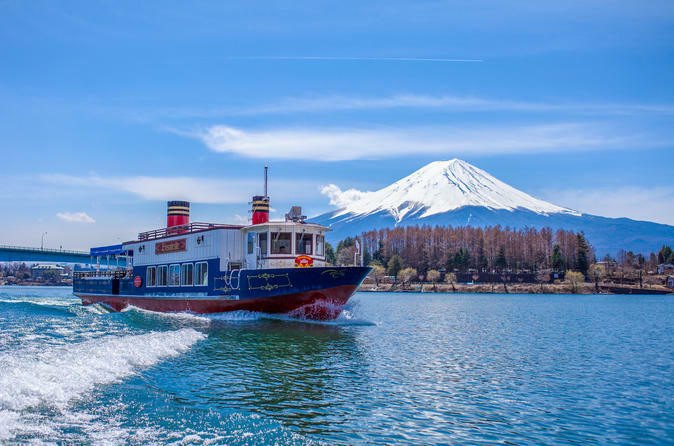 After a relaxing lunch in Fuji-Q Highland, head to Kawaguchiko (Lake Kawaguchi), for an afternoon that promises to amaze you with the panoramic view of Mt. Fujii and Lake Kawaguchi. The day tour takes you on board of the Excursion Ship on the lake and on the Panoramic Ropeway, but we recommend you stop at Pixpot, the perfect spot for that perfect picture, before the Pleasure Boat departs. For those looking for that small something to take back , "Miharashi-Tei" is the souvenir shop to visit before boarding the bus back to Tokyo (17:00), where you will be dropped off at either the Metropolitan Government Office parking lot in Shinjuku, Tokyo (ETA 19:10), or the Sunshine Hotel in Ikebukuro, Tokyo (ETA 19:35).